Unless, of course, Monkey D.Luffy can stop them! 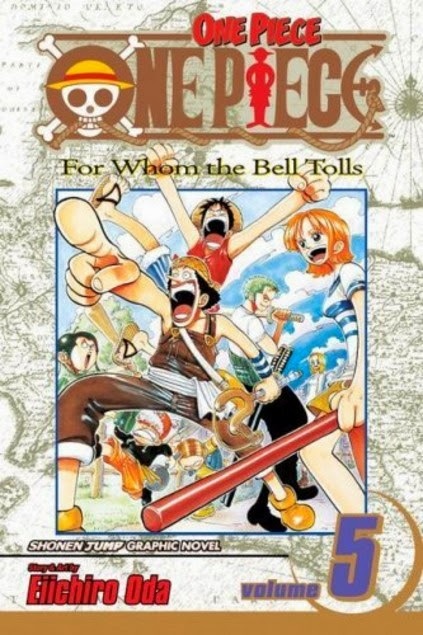 All Luffy has on his side are the sword-wielding first mate, Zolo; his thieving navigator, Nami; Usopp, a local kid with a knack for telling lies; and his own bizarre rubber-limbed powers. If these four amateur pirates want to stop the entire Black Cat crew, they'll have to come up with a pretty slick plan...."
Borrowed a copy from my local library. The first three volumes didn't impress me much but I actually started to like the main characters with this volume and was involved in the plot. First major bonus: no clowns! Yeah! Seriously, though, the villains here are good ones: Kuro and Django are pretty awesome and the battles were great. The Meowban brothers added some humour to the fighting and there was all around humour in this volume that I genuinely enjoyed. This is, shall we say, a very strange story, way out there in the weird zone but I've found my groove and like all the characters at this point and even find Usopp redeemed himself in my eyes, but I do hope he does not become a full-time member of the crew. LOL. Everything has ended in the middle of a serious situation with battles mid-stream and Kaya running for her life; also to save the village. This leaves us hanging mid-action and has me wanting to read Vol. 5. Now Usopp's village is under attack by the Black Cat Pirates, one of the most legendary and feared crews on the high seas. And three young would-be pirates have joined him in defending the village: Nami the thief, Zolo the swordsman, and Luffy, the straw-hatted wannabe pirate with incredible rubber powers. Usopp is about to find out how an imaginary pirate stands up to the real thing… and what it means to be a real pirate. His neighbors would never believe it in a million years..."
The story has hit is stride now for me. This volume continues the story of the battle against Captain Kuro started in Vol. 4. This plays out; we are given background material on the new characters; and let into Kuro's real dastardly objectives. The battles continue and this storyline comes to an end. Unfortunately as I had hoped would not happen in the last volume Ussop does join our major characters as a member of the crew. My favourite is Zolo though, and I just love him when he puts the bandanna thingie on his head, he looks so awesome! 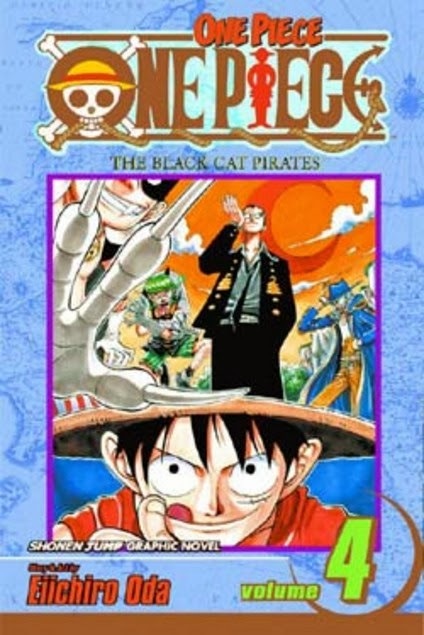 The last few chapters start a new storyline as the crew sets out to sea again and several new characters are introduced; Luffy gets them in a bit of trouble and they find themselves in a situation which turns out to be more than it first appeared. I'm enjoying this series now and glad I continued on past the first 3 volumes. My son is also really into it now and actually wants to start buying the books instead of using the library, LOL. He NEEDS them on his shelf, don't ya know. 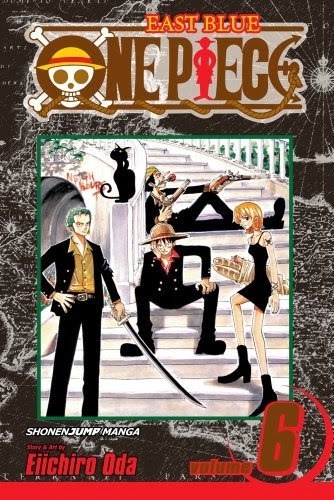 "Luffy's pirates thought they were just stopping in for a quick bite...but now Luffy's been made a busboy on Baratie, the oceangoing restaurant, and it turns out some of the worst-mannered pirates on the Grand Line are just dying for a meal. Always one to look on the bright side, Luffy sets his sights on Sanji, the smart-talking, skirt-chasing assistant chef on the Baratie, as the Merry Go's new cook. But it'll take more than a vicious pirate battle and a little sweet talking from Nami to convince him to leave the Baratie and join Luffy's team. His oath to feed any and all pirates in need keeps getting in the way. The question is: what do you do when the very same pirates you just fed now want to serve you up for dinner?." This book continues on with the new storyline just started in the last volume; some new characters are introduced, a new member joins the crew and sadly we lose a crew member as well. I have a pretty good feeling this person will be back though. The plot here is pretty silly but I have to say I liked it; the pirate chefs are a lot of fun and the Hawkeye character sets up a storyline that can be revisited in the future. I had a rough start to this series but am now happily emerged in its wild and wacky world.